Before this study, the origins of the people who took part in the rituals and the extent of the journeys people would take, have been a mystery. Dr Madgwick said finding pigs in the vicinity of the feasting sites would have been “relatively easy” making the fact they brought the animals long distances “arguably the most startling finding” as this would have required “a monumental effort”. “This suggests that prescribed contributions were required and that rules dictated that offered pigs must be raised by the feasting participants, accompanying them on their journey, rather than being acquired locally,” he said. Stonehenge is one of the most impressive and best known prehistoric stone monuments in the world. Ever since antiquarians’ accounts began to bring the site to wider attention in the 17th century, there has been endless speculation about its likely purpose and meaning, and a recurring theme has been its possible connections with astronomy and the skies. was it a Neolithic calendar? A solar temple? A lunar observatory? A calculating device for predicting eclipses? Or perhaps a combination of more than one of these? In recent years Stonehenge has become the very icon of ancient astronomy, featuring in nearly every discussion on the subject. And yet there are those who persist in believing that it actually had little or no connection with astronomy at all. A more informed picture has been obtained in recent years by combining evidence from archaeology and astronomy within the new interdiscipline of archaeoastronomy – the study of beliefs and practices concerning the sky in the past and the uses to which people’s knowledge of the skies were put. This leaflet attempts to summarize the evidence that the Stonehenge monument was constructed by communities with a clear interest in the sky above them. This leaflet is one of a series produced by the Royal Astronomical Society (RAS). An electronic version is available for download at http://www.ras.org.uk. Vernal (Spring) Equinox at Stonehenge. The Spring Equinox in 2017 falls on March 20th and occurs at 10:28am GMT. The time is for the instant when the Sun crosses the celestial equator moving northwards and has a celestial longitude of 0°. Everywhere on Earth has a day and night of almost equal length and it marks the beginning of the northern spring season. There is considerable debate in the archaeoastronomy community as to whether the Equinox had any special meaning for the builders of Stonehenge. They had no accurate clocks by which they could determine when the day and night were almost exactly equal and discovering the mid-point between the Winter and Summer solstice can be done in a couple of obvious ways. You can count the days and divide by two. Or you can mark the summer and winter sunrise positions along the horizon and divide that line into two equal parts. These two methods give different results. For example, counting the days between Winter Solstice 2016 (December 21st) and Summer Solstice 2017 (June 21st) gives 182 days. Half of that is 91, meaning the midpoint would fall on March 22nd 2017 – two days after the actual Equinox. Using the “divide the horizon” approach causes an additional problem – at the Solstices do you mark the first gleam of the Sun appearing, the point when half of it is above the horizon or when it has fully risen and the full orb is standing exactly on the horizon? The difference in position between using “first gleam” and “full orb” is about 1.5° because the Sun rises at an angle. As a result the halfway position could be 0.75° different depending on your choice and that is one and a half times the width of the Sun’s disc, potentially putting your Equinox out by a day or so. In any event, there is no alignment through Stonehenge for the Equinox and what’s more there isn’t even a clear sightline directly through the monument that runs true East-West towards the Equinox sunrise position, in the way that there are clear sightlines for the Solstice sunrises and sunsets. That doesn’t mean you can’t get a nice photo of an equinox sunrise when it’s clear, because you can. English Heritage Charitable Trust allows everyone in to the centre of the monument for the Spring Equinox sunrise, in the same way that they do for the Autumn Equinox and the two Solstices, through their “Managed Open Access” events. It’s one of only four occasions in the year when open access is allowed. It’s worth checking with their customer services department (0370 333 1181) a week or so ahead because sometimes they set the actual day of the open access to be different to the day when the Equinox occurs. 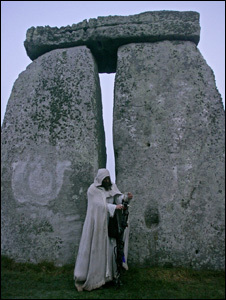 Equinox open accesses attract fewer people than the Solstices – in the several hundreds rather than tens of thousands – and there are modern Druid ceremonies which are held in the circle around dawn, so if you prefer a quieter experience then attending an Equinox is a good choice. If you are considering visiting Stonehenge for the Solstice or Equinox celebrations you can join a specialist organised small group tour. Use a only a reputable tour operator who respect the conditions of entry. Stonehenge Guided Tours are the longest established company offering award winning discreet tours from London. Solstice Events offer small group sunrise tours using only local expert guides.